So Christ answers Peter’s question, “Lord, how often shall my brother sin against me and I forgive him?” Scripture does not record Peter’s reaction, but we can guess it was surprise and, perhaps, consternation. Forgiveness does not come easily to human beings. Christ practices what he preaches. He forgives endlessly in the Gospels—the woman taken in adultery, his own disciple who denies him three times, even his executioners. Regarding this last instance, I have often wondered whether his mother felt the same way. This question, “How does one practice forgiveness when her child has been murdered,” has haunted me these past few months. We have witnessed the very public deaths of several black men in the media: Michael Brown, Eric Garner and Walter Scott, among others. In interviews with journalists, grieving parents are often asked whether they forgive their son’s killers, and some actually say yes. As the mother of three sons, this evokes in me equal parts amazement and admiration. I don’t think I could be so generous in their circumstances—and I pray I never have to find out. Galvanized by the horror of a war that will lead to more deaths of more sons and daughters, to more grieving parents, Orlando and Phyllis devote themselves to the challenge of forgiveness and reconciliation, choosing peacemaking over rage and revenge. Jamison’s film faithfully follows them along this difficult path, illuminating it as both a terrible struggle and a source of freedom and empowerment. Among the most remarkable of their actions is Phyllis’s befriending of Aicha el-Wafi, the mother of the 9/11 conspirator Zacarias Moussaoui. The sight of another mother’s suffering as her son is arrested, tried and threatened with the death penalty—and remembering her own lost son’s youthful rebelliousness and episodes of poor judgment—Phyllis seeks out the mother of her supposed enemy and stands in solidarity with her. Both Phyllis and Orlando eventually testify at Moussaoui’s trial, playing a definitive role in the court’s decision to spare his life. Among the many powerful moments in the film is a scene in which the Rodriguezes visit a prison and participate in a conversation with the chaplain and several young men incarcerated for committing violent crimes. As these inmates tell their stories, it becomes evident that the one thing they all desire is forgiveness from the families of those they have harmed—something that few of them, if any, have received. They are as much imprisoned by the pain of being unforgiven as by the concrete block walls and iron bars that surround them. As Orlando and Phyllis listen to them with great compassion, I was struck by the power of forgiveness to set the soul free. To practice forgiveness frees the giver, and to receive forgiveness frees the sinner. Neither the Rodriguez family nor the convicts can undo the past. But forgiveness could make the present bearable and make life livable again. Perhaps this is what the parents of those young men killed by police know and what all parents who lose a child instinctively seek. Perhaps forgiveness is given—and received—in the name of the daughter, in the name of the son. This article also appeared in print, under the headline "In Our Sons’ Names," in the May 18, 2015 issue. 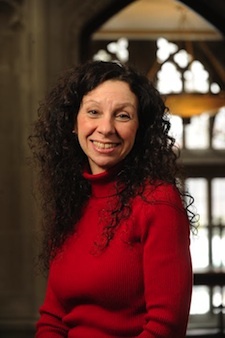 Angela Alaimo O’Donnell is a writer, professor and associate director of the Curran Center for American Catholic Studies at Fordham University. Twitter: @AODonnellAngela.